Week 5 of the AFL season saw the Surprise Saguaros compile a 2-3 record, with two of their losses coming in the final at-bats of their opponents. At 11-15 on the season, they sit in third (last) place in the West Division. 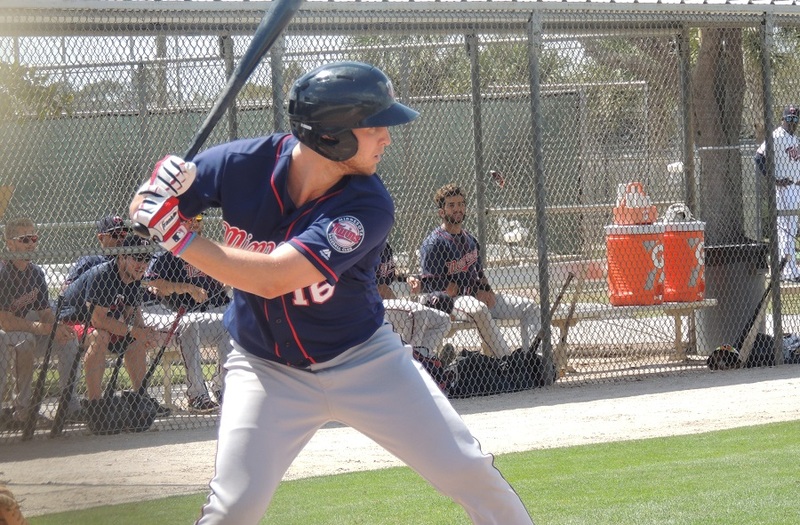 Twins prospects had a mixed bag in week 5. One pitcher gave up his first earned run of the season, while the others all had scares but came out unscathed. One hitter racked up five RBI’s on the week, and another may have had his season cut short due to a scary outfield collision. To find out what happened with all the Twins prospects in the AFL during week 5, keep reading! Tyler Jay: 1 appearance, 1.0IP, 2 BB’s, 2 K’s; 5.87 ERA (overall). After appearing in the Fall Stars game on Saturday of last week, Jay made just one appearance in week 5 of the AFL season. That came on Thursday in a 6-2 loss to the Glendale Desert Dogs. With the score already 6-2, Jay came on for the top of the sixth inning. He struck out the first batter of the inning, before issuing a walk to the next. This pattern repeated a second time giving him two outs with two runners on base. He got the final out with a pop up to second base to deliver a scoreless inning. LaMonte Wade: 4 games, 1-8, R, HR, 3 RBI, BB, 2 K’s; .238/.351/.413 (overall). Wade had perhaps the most noteworthy week of Twins prospects in Arizona, but the reason for that was an unfortunate one. He appeared in four games on the week, but got at-bats only in the first three. In the first game of the week on Monday, a 2-1 walk-off loss to the Salt River Rafters, Wade batted seventh and played in right field. He finished the game 1-4, but was responsible for the Saguaros only run of the game, when he slugged his second AFL home run in the top of the fourth inning. This gave Surprise a 1-0 lead that they held until the bottom of the ninth inning. Wade’s second game of the week came in the loss to Glendale on Thursday, and like the rest of his team didn’t have much success. Batting fifth, he finished this one 0-2, but did draw a walk in the sixth and was hit by a pitch in the eighth, so he did reach base multiple times. In Friday’s 11-5 win over Peoria, Wade hit sixth in the lineup and was productive despite not reaching base in the game and also accounting for all three outs in the Saguaros seven-run fifth inning. Wade drove in the first run of the game with a sacrifice fly in the second inning, then the last of the game with another in the seventh that made the score 11-2. In that seven run fifth inning, Wade led off with a strikeout, and when the lineup got back around to him he grounded into a double play. Weird and unfortunate things happen in baseball games, and that was the case for Wade on Saturday. In the top of the second inning, Wade and teammate Oscar Mercado collided on a fly-ball heading toward the gap. Mercado made the catch for the final out of the inning, but Wade’s diving attempt put him in harm’s way on the collision. Wade was taken off the field on a stretcher and diagnosed with a concussion, likely putting an end to his AFL campaign a little early. In good news, Wade was reportedly able to return to the stadium before the conclusion of the game, so it could have been a lot worse. I’ve had a concussion or two myself from playing baseball, so I know how this feels! Get well soon, LaMonte! Chris Paul: 3 games, 5-13, 4 R’s, 3B, HR, 5 RBI, 4 K’s; .279/.323/.459 (overall). Paul’s first game of the week came on Tuesday, in a 6-1 win over Glendale. Batting fifth and playing first base, Paul finished 1-5 with a strikeout. His hit came in the form of a single to lead off the sixth inning, but he was erased quickly on a double play ball from the next hitter. In Friday’s win, Paul batted seventh in the lineup behind Wade, and collected two hits on the day. In the seven-run fifth inning, Paul got the hitting started with a one-out single, and later scored on a ground ball from Sean Miller for the first run of the frame. He then led off the top of the sixth inning with his second AFL home run to left field. He finished 2-4 with two runs scored and the home run. Paul put up even better numbers in Saturday’s 11-10 loss to Peoria, where he batted sixth in the lineup. His first hit of the game came in the fourth inning, when Surprise again put seven runs on the scoreboard. His single brought in the first two runs of the game for Surprise to make the score 6-2, and they would take the lead with the long two-out rally before the inning was over. In the bottom of the fifth Paul came up with two runners on base and delivered a triple deep to center field to extend their lead to 9-6. He then scored on a passed ball to make it 10-6 before the Saguaros pitching gave the lead back in the last two innings. All told Paul was 2-4 with two runs scored and four RBI to end his week on a high note. Andrew Vasquez: 2 appearances, 1.1IP, H, BB, 3 K’s; 0.77 ERA (overall). Vasquez was the only Twins pitcher on the week to make multiple appearances, and they came in Thursday’s and Saturday’s contests, both losses. He got the eighth inning with his team down 6-2 to the Desert Dogs on Thursday, and retired the first two hitters of the inning with strikeouts before a fielding error and single put runners on the corners. He was able to get out of that jam by getting a ground ball for the inning's final out. He threw 27 pitches in the outing, with 19 going for strikes. On Saturday against the Javelinas, Vasquez again came into the game in the eighth inning but this time it was with the bases loaded, two outs, and his team now up by two. He was charged with a blown save after he walked in a run, then hit a batter to tie the game at 10 before picking up a strikeout to end the inning. On ten pitches, he threw just three strikes in the outing and in the ninth inning Peoria took back the lead. Ryan Eades: 1 appearance, 1.1IP, 3 H’s, ER, 2 K’s; 0.77 ERA (overall). The righthander’s lone appearance on the week came in Thursday’s 6-2 loss, when he was the first reliever summoned from the bullpen, with two outs in the third inning after the starter had run in to heaps of trouble. Three runs had already scored in the frame, and the first batter Eades faced clubbed a ground-rule double for a fourth before he picked up a strikeout to end the inning with the Saguaros now down 5-0 early. Back out for the fourth inning, Eades gave up his first earned run of the AFL season, as the leadoff man clubbed a home run to left field. He struck out one more hitter and gave up a single but no more damage in the inning. On the game, 15 of his 18 pitches went for strikes, including four swings-and-misses. Tom Hackimer: 1 appearance, 1.0IP, 2 BBs, K; 2.79 ERA (overall). Hackimer’s only appearance on the week was also in Thursday’s loss to Glendale, coming into the game after Tyler Jay for the seventh inning. He hit the first batter of the inning with a pitch and later walked two batters that loaded the bases with two outs, but picked up a big strikeout to keep any damage off the scoreboard. Of his 21 pitches in the inning, just 8 went for strikes. Sean Miller: 2 games, 1-7, RBI, BB, K; .289/.333/.311 (overall). The middle infielder saw action in two games in week five, playing second base and batting ninth on Tuesday and Friday, both wins for the Saguaros. Miller finished Tuesday’s game 1-4, picking up a single to leadoff the top of the ninth in the 6-1 victory over Glendale. He ended up stranded on third base with the bases loaded. On Friday Miller was 0-3 in the batters box, but picked up an RBI and scored a run for his team in the 11-5 rout. In the seven-run fifth inning, his ground ball to third base scored Chris Paul as the throw home was late, allowing him to reach first. He later scored on a single. In the sixth inning Miller drew a walk but ended up stranded in while in scoring position. - As they do every week during the minor league season, Baseball America has an AFL Hot Sheet, with Chris Paul checking in at #9 for his performance this week, and is the first Twins prospect to appear on the lists. - In somewhat disappointing news for a prospect follower like me (and perhaps since it’s fun to mention #SonOfPudge every once in a while in the minor league reports), pitcher Dereck Rodriguez has moved on from the Twins organization and signed with the San Francisco Giants. I’m disappointed to see him go as he was a very intriguing prospect to follow with his switch to pitching. Good luck Dereck, hope to see you in the bigs soon! - Paul Sporer of RotoGraphs gives his annual favorites from his time out in Arizona. While there aren’t any Twins in the list of prospects this year, he does mention Brian Dozier and Eddie Rosario as some of his favorites that he has seen in the past. Please feel free to ask questions and discuss the performances during the last week! Not exactly an awe inspiring week. Thanks a lot for these reports. Together with Ashbury’s reports, unfortunately, it doesn’t seem like the Twins are having a noteworthy season in the fall league. Is anything notable going on in Fort Myers with other prospects? As far as I know, nothing like the "instructional league" or otherwise happened or is going to happen in Fort Myers, due to Hurricane Irma. We've been a bit spoiled with the types of prospects the Twins have sent to Arizona the past few seasons, I would agree this bunch is a considerable step down in top talent but there are plenty of reasons these guys are here! Thanks. In my imagination, I see Alston working with Stewart in Fort Myers to turn him into a beast.